The Data Visualization Team here at Bocoup has been hard at work building an exciting interactive experience. Today we are really thrilled to share our work with you. Stereotropes is an interactive visualization experiment, exploring a set of “tropes” authored and tracked by a community of contributors on TV Tropes. Tropes are devices and conventions used in storytelling to represent patterns recognizable by the audience. Stereotropes provides a way to explore these tropes through several visual experiments. While tropes can be used to cover anything including people, actions, and places, Stereotropes orients the analysis around gender by showcasing a specific subset of tropes identified as being Always Male or Always Female. This dataset allows us to ask interesting questions about the representation of gender in films as seen through the uses of these tropes. Stereotropes offers several explorations around this data. First, every trope in our collection gets its own page where you can learn more about it, see how its use changes over time, and examine the adjectives that describe it. 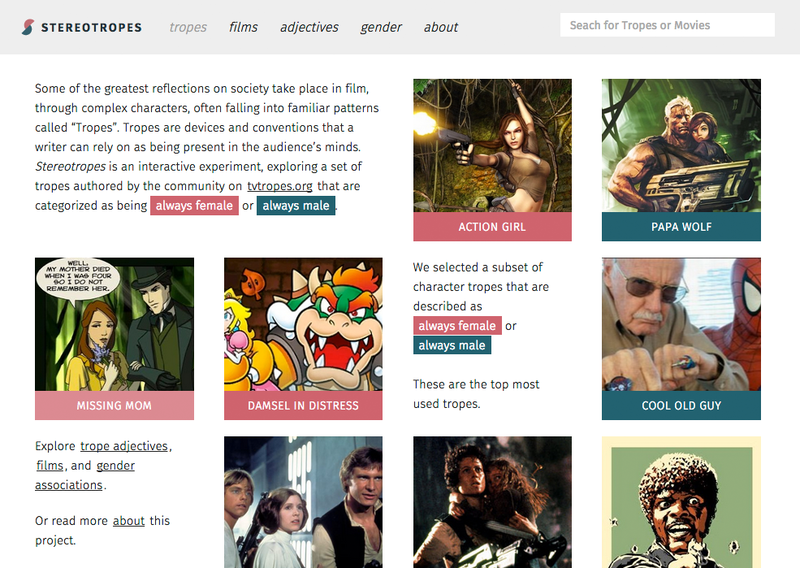 Use our trope adjective visualization to explore the words used to describe a particular trope in relation to words used for all tropes. Adjectives that are more strongly associated with this trope are closer to the left while those that are more generic (aka, used in a lot of other tropes) are to the right. Hover on adjectives to reveal other tropes that use them. Hover on a trope name to show the adjectives they share. The Gender Visualization explores how different adjectives are used across our two categories of tropes, male and female. Adjectives more likely to describe a female character trope are placed to the left side of the scale, while those that are associated more frequently with male character tropes are placed to the right. The Adjectives Visualization looks at the top 100 adjectives used to describe tropes, and the connections between them. Many of the top adjectives tend to appear together frequently. Among these we see examples of adjectives used to describe various traits associated with characters, from physical appearance, such as ‘beautiful’ and ‘attractive’, to age, such as ‘young’ or ‘old’, to personality traits, such as ‘sympathetic’. Tropes are tied together through the films in which they appear. Most films have characters easily described by many of the tropes in our dataset. You can search for your favorite films, or browse films by genre and time period. Working with data that has to do with gender is complicated. We feel very responsible for the way in which we portray this information and whether we are moving with or against the slow and steady effort towards social progress in the ways we talk about gender. To start with, our dataset is inherently binary. We chose only the tropes that were marked as being ‘always male’ or ‘always female’. There was an additional dataset of tropes labelled ‘always unisex’ that we chose not to use. Our main focus was on exploring the language used to describe stereotypical male and female characters, and we chose to focus on those to highlight the differences in language associated with the two poles. Our hope is that in exposing some of the tropes that pervade our culture, we can shed light on them and compel ourselves and those around us to confront them head on. We also hope to acknowledge our own biases and call out the biases of others while fostering greater awareness for all. We know these tropes permeate our media and every day people all along the gender spectrum wonder about their place in the world as a result. We hope Stereotropes can be a small step in bringing us closer to a culture that is more critical in our thinking about the stereotypes reflected in media and the ones we hold personally, as well as more thoughtful about our collective experience of gender in society. We are not done here! In the next few weeks we will be posting more detailed technical blog posts about the inner workings of Stereotropes, including more on the data analysis and visualization designs. We’re excited to share with you how we built this and would love to know what you think. You can read more details on the about page, or get in touch with us by emailing stereotropes@bocoup.com as we would love to hear your thoughts.